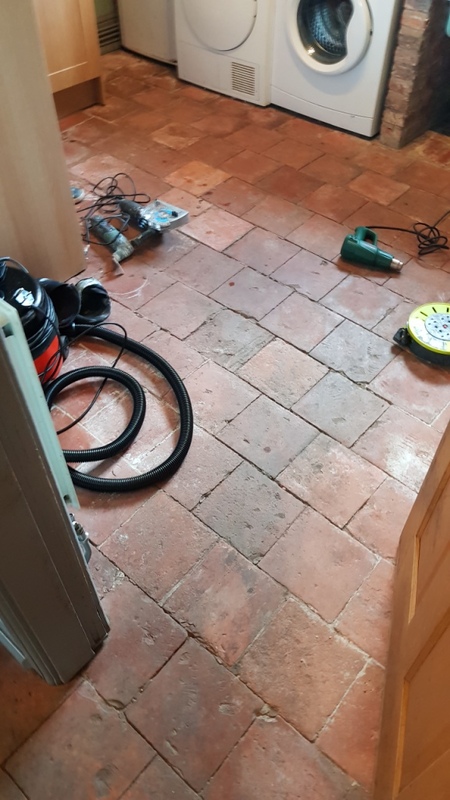 This is the first of two visits I made to a property in Lingfield, East Surrey which had some very old features including a Pamment tiled hallway and a 200-year-old stone Fireplace. 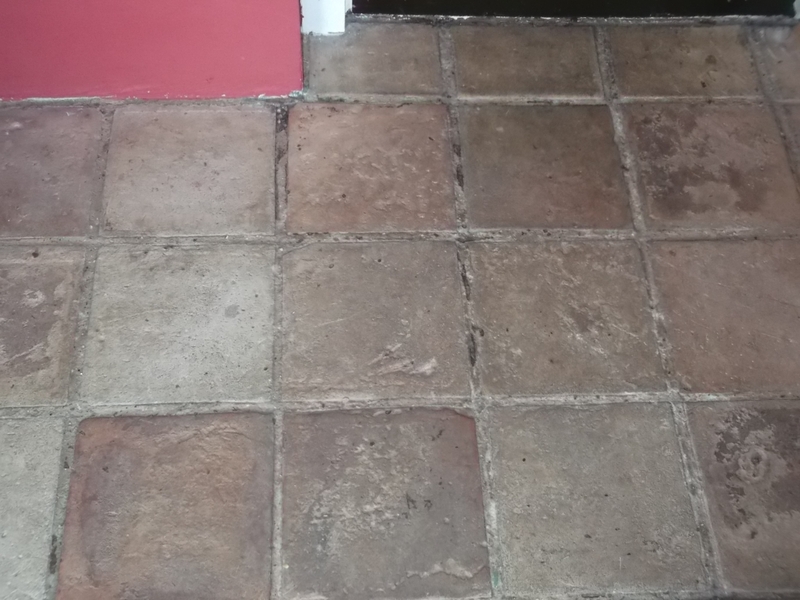 In both cases the owner had made an attempt at restoring them before deciding to give up and call in Tile Doctor. 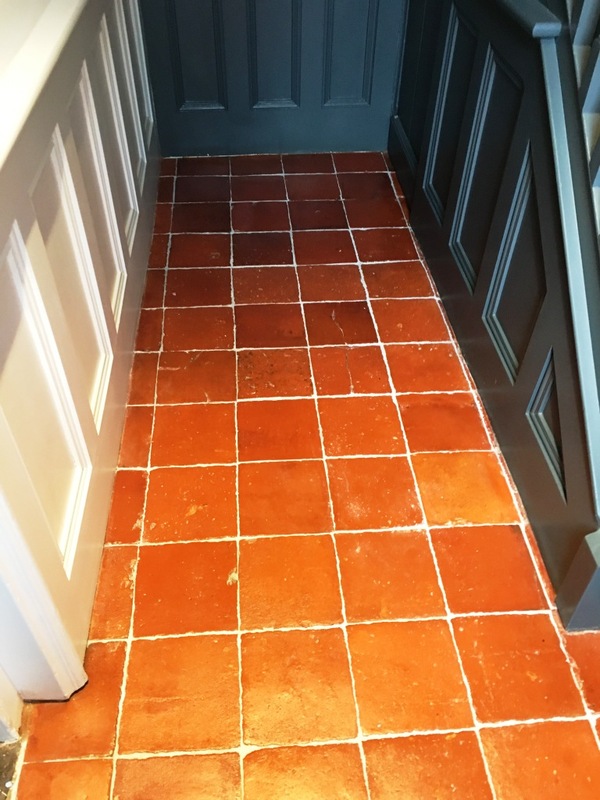 For this article I’m going to focus on the Pamment tiles which like Terracotta are made from Clay and are a common flooring material in Norfolk and Suffolk. 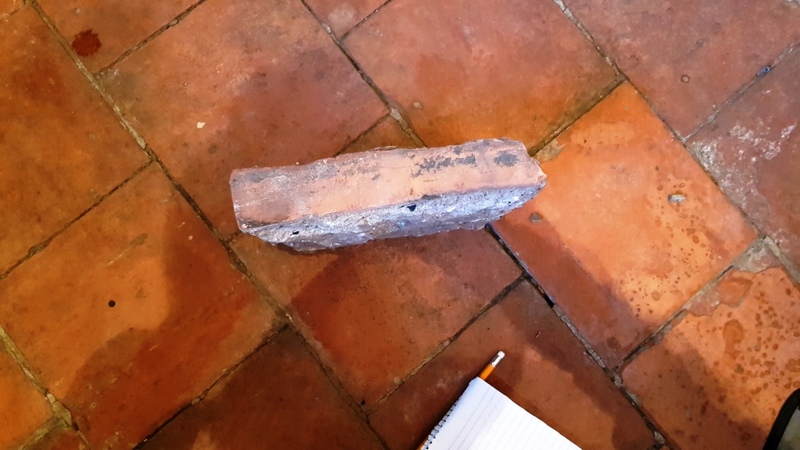 We don’t usually see Pamment tiles in Surrey however Lingfield is a very old village where the Church dates to the 14th century so you never know what you’re going to find. 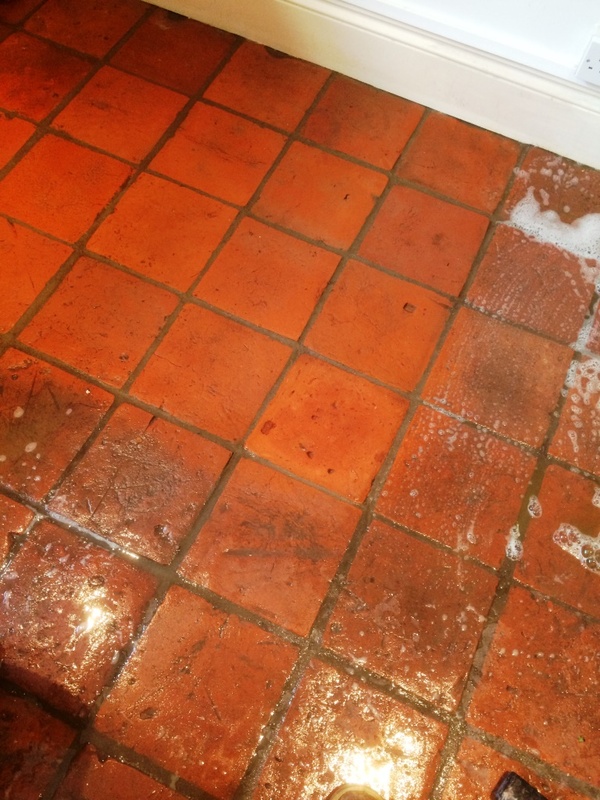 I started with the job by scrubbing the Pamment tiles with a strong dilution of Tile Doctor Remove and Go, which is a heavy-duty cleaner/stripper designed for removing coatings from stone, tile and grout. The product was applied and left to soak into the tile and grout for about ten minutes before being scrubbed in with a black pad fitted to a rotary machine. The soiled solution was then removed with a wet vacuum. 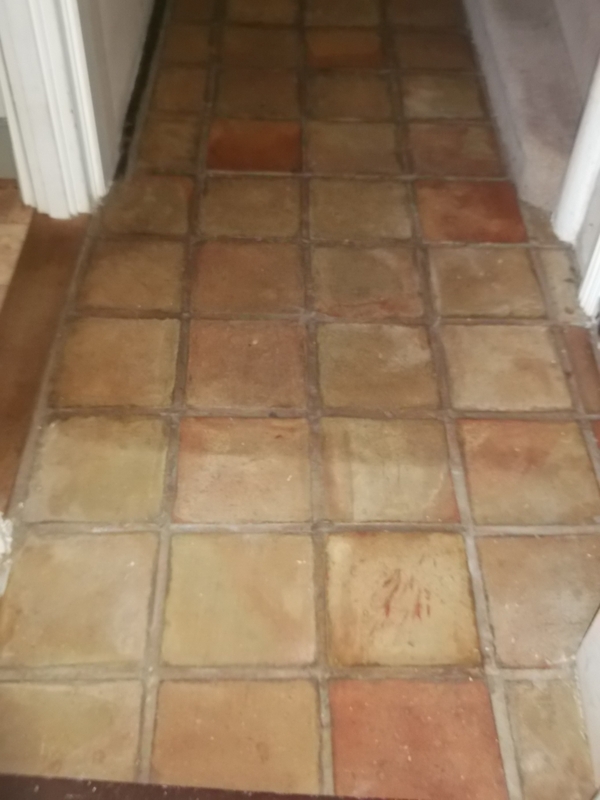 Next step was to give the tiles an acid wash using Tile Doctor Grout Clean-up which is applied using the same method as before. 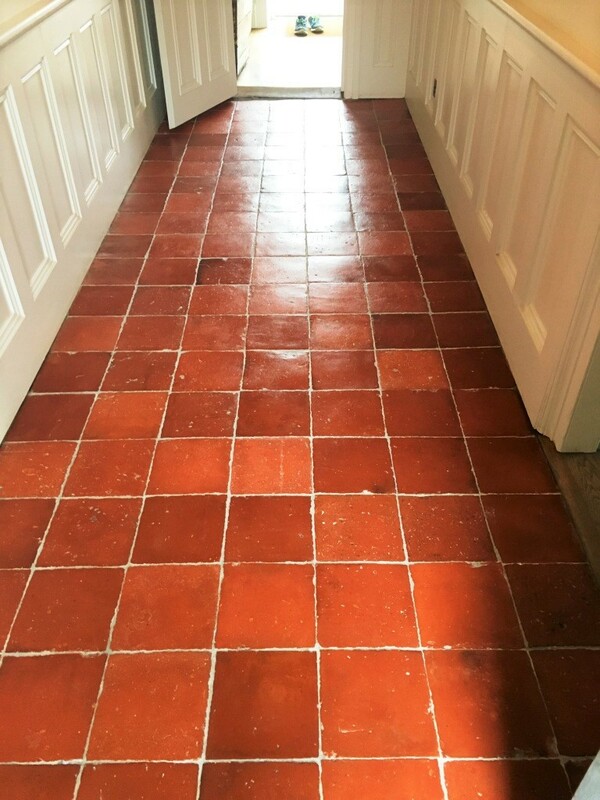 Acid washing a tiled floor removes mineral deposits such as alkaline salts from efflorescence and will also take off thin grout smears that can ruin the look of a tiled floor. Once this was done and the soil removed the floor was washed down with clean water to ensure all the acid was removed and the floor neutralised. 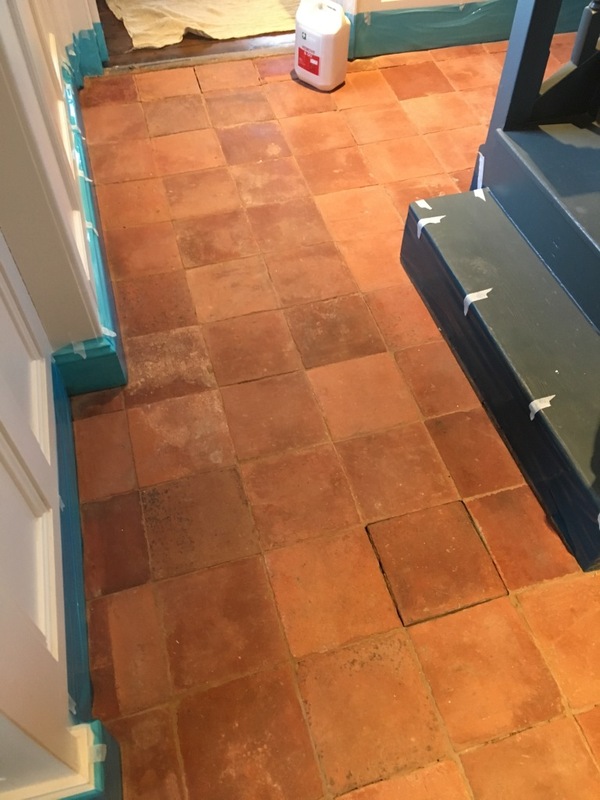 You can see from the photographs that the grouting between the tiles had failed in areas, so this was replaced to ensure the floor was structurally sound. After cleaning up the floor it was then left to dry out thoroughly for a few days. 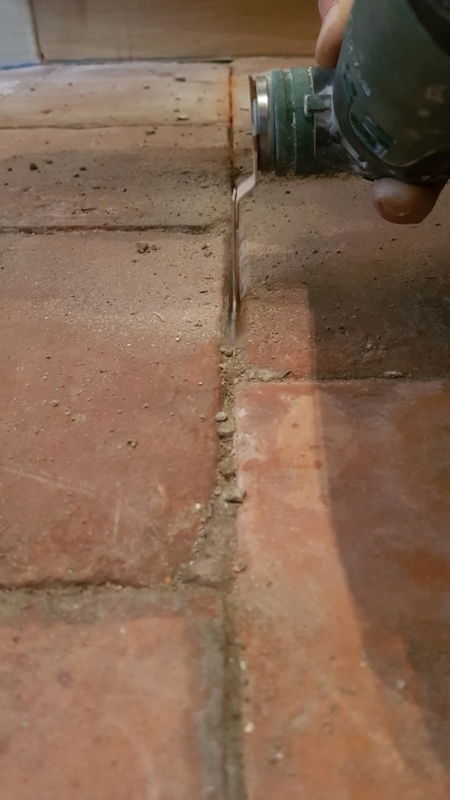 On my return to do the sealing I first checked the floor had dried sufficiently with a damp meter, we never recommend sealing a damp floor as this can cause problems with the sealer curing leading to patchy results. All was well and for this floor I decided on applying a single coat of Tile Doctor Ultra-Seal first which seeps into the pores of the tile and adds a base layer of protection. 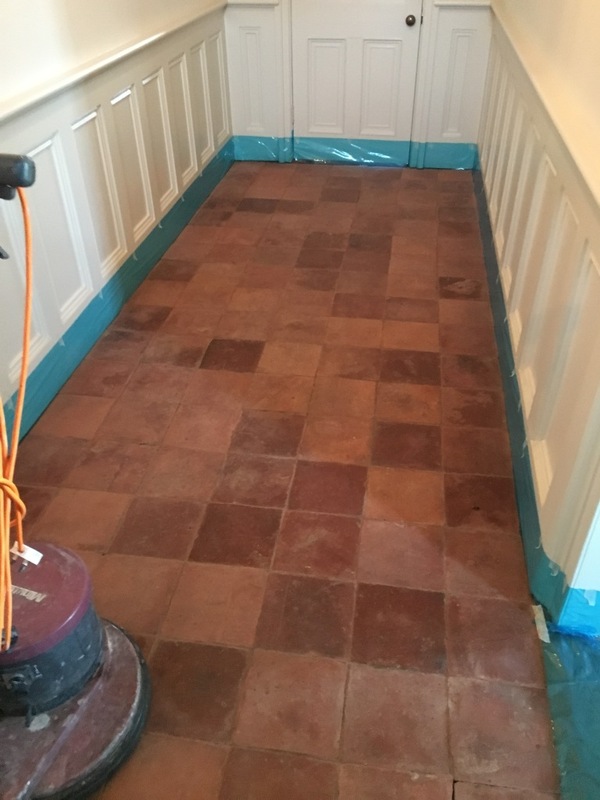 This was then followed up with multiple coats of Tile Doctor Seal and Go which adds the final layer of protection and enhances the look of the tile to leave a nice subtle sheen. The work took two days in all and as you can see the floor now looks transformed and will be much easier to maintain going forward. 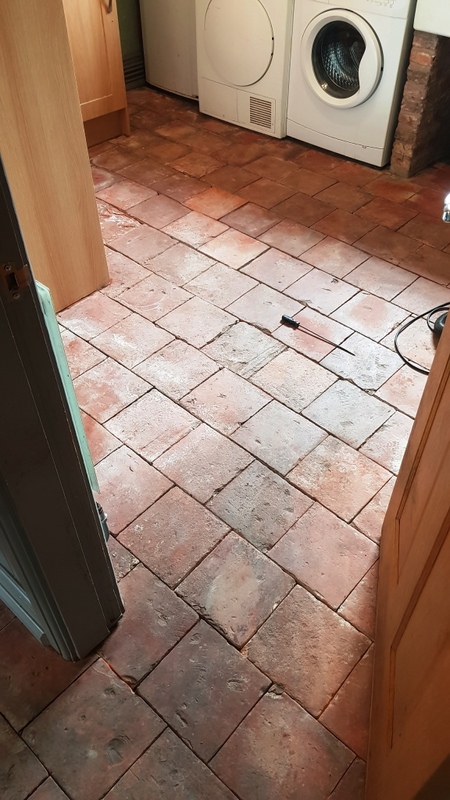 If you like the rustic look a Pamment tiled floor brings to a property, then there are several UK suppliers who still retail these tiles including Norfolk Pamments and Antique Style Flooring. 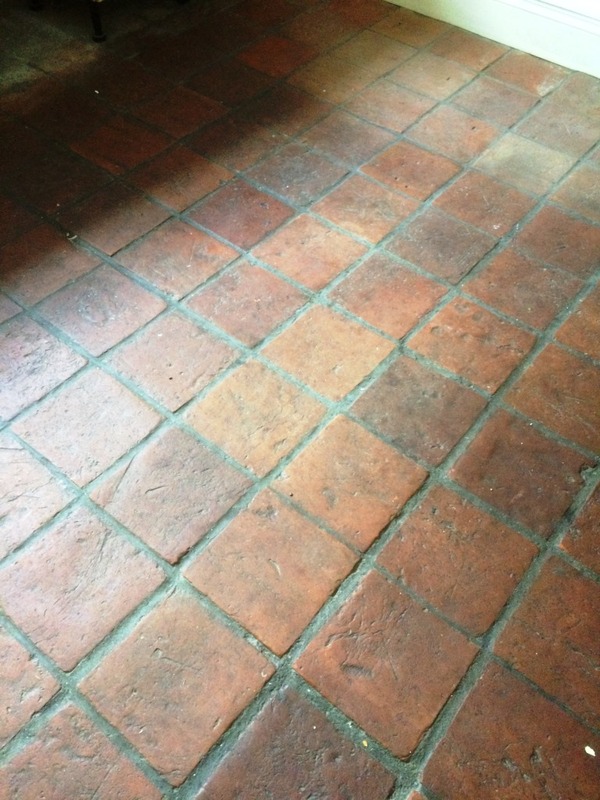 Also consider searching eBay, Gumtree and reclamation yards for second hand floors for restoration. 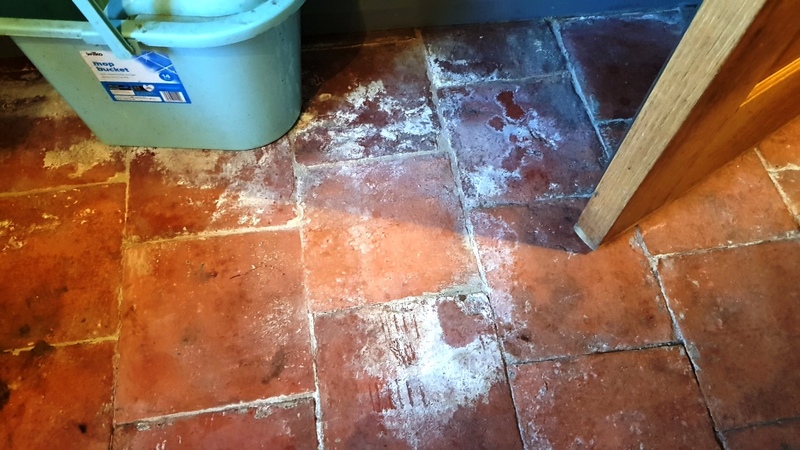 I was contacted by a client living in Ipswich, the county town of Suffolk, who had a dirty Pamment tiled floor that needed some attention. 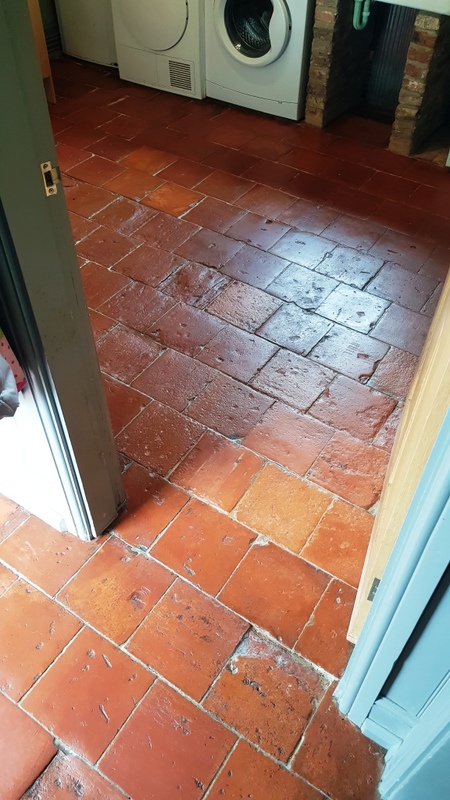 The sealer had pretty much worn off the surface of the tiles which had allowed dirt to become ingrained in the pores of the stone, making it difficult to clean for the homeowner. 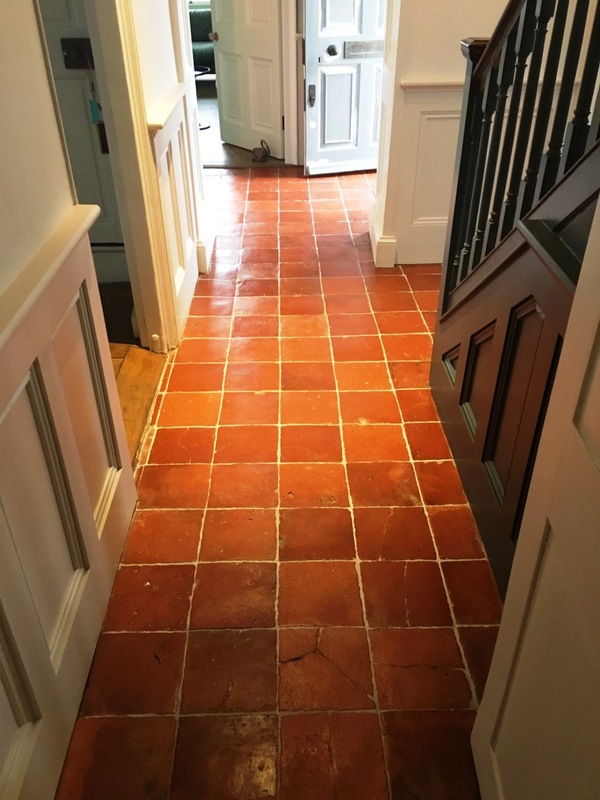 Pamment tiles are very popular in Suffolk homes; they are made locally from clay and, like Terracotta, are porous and therefore need to be sealed. Pamments are quite versatile, and can be used for internal floors and external surfaces like patios. 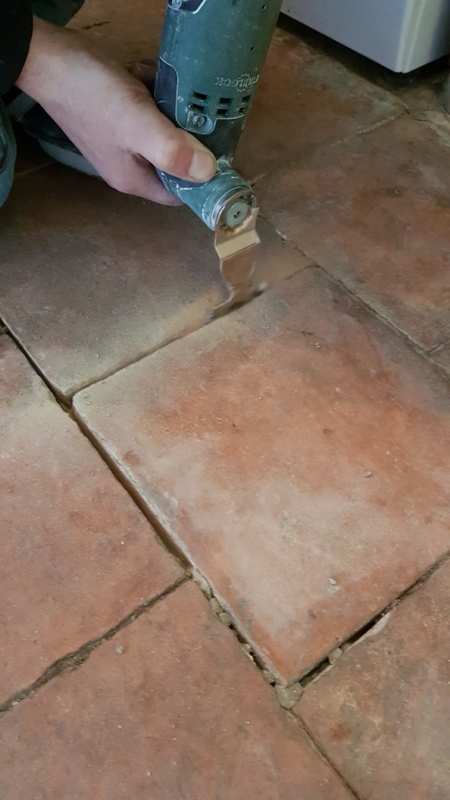 To remove the remaining sealer and clean the tiles I decided to apply Tile Doctor Remove & Go, which was diluted with water to form a medium strength solution. I applied a layer of this solution to the floor, leaving it to soak into the pores of the stone for approximately ten minutes. I then worked the solution into the tiles using a scrubbing pad fitted to a rotary machine. Remove & Go is versatile cleaner, suitable and safe to use on many natural stone floors, ceramic tiles, grout and more. I rinsed the solution off the floor with water once it had worked its magic, and extracted the resulting soiled residue with a wet-vac machine. 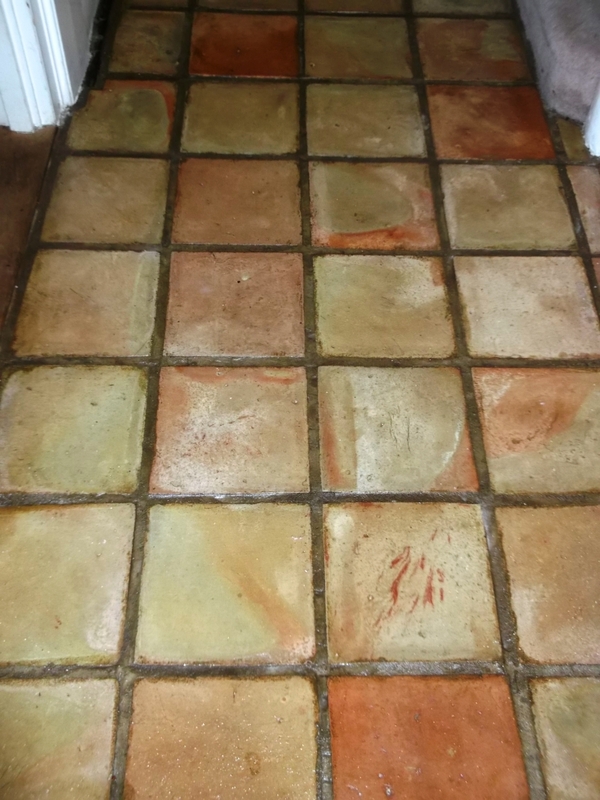 In order to tackle the particular stubborn stains, I repeated this process until I was satisfied that the floor had been cleaned to the highest standard possible. The floor was then left to dry overnight before returning the next day to complete the seal. 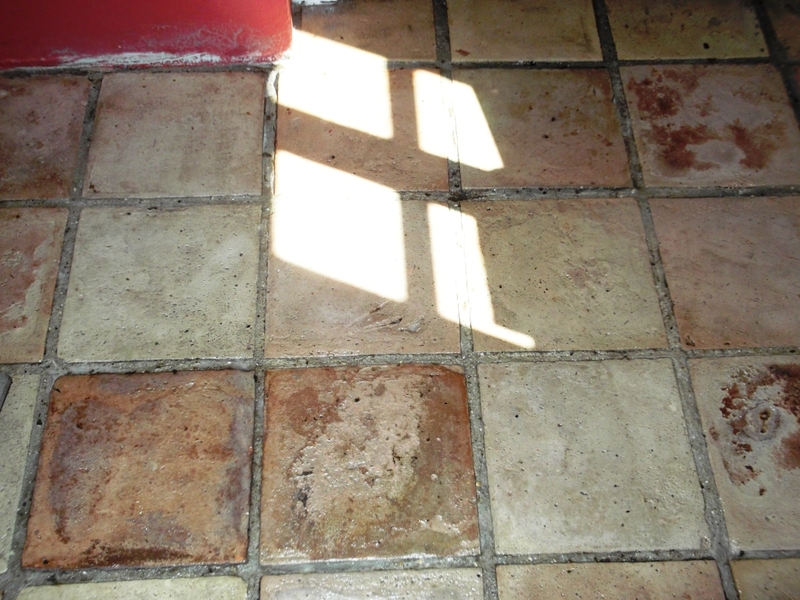 It is imperative that a tiled floor is given at least 24 hours to dry completely. This is because any excess moisture left on the floor can potentially damage the performance of the sealer. However, in this case I installed a dehumidifier to speed up the drying process. 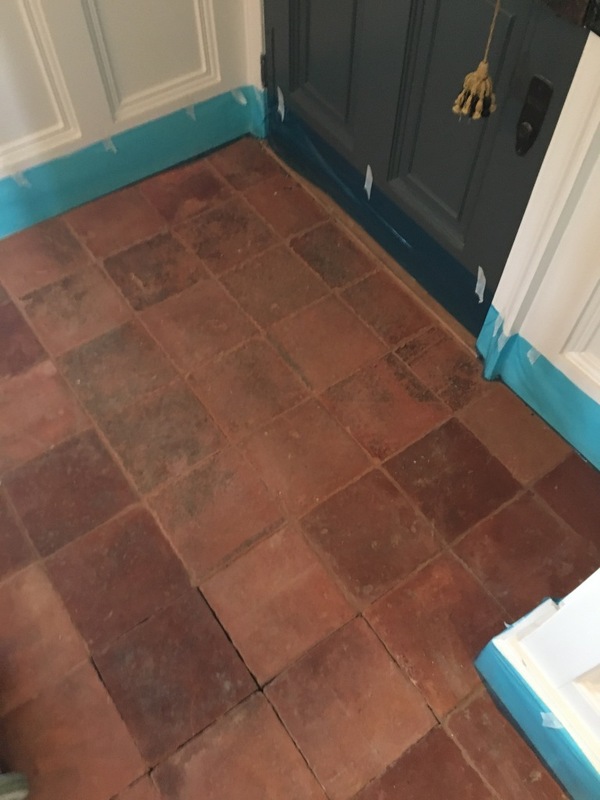 To seal the Pamment tiles I used a total of six layers of Tile Doctor Seal & Go, which provided a robust, durable surface seal along with an aesthetically pleasing, low-sheen finish (as you can see from the photos). 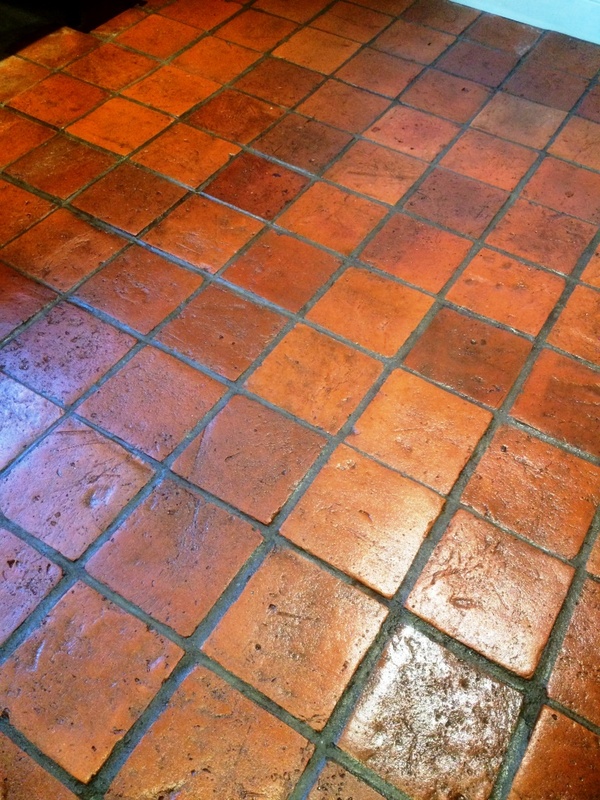 Seal & Go is the go-to sealer for internal, unsealed porous surfaces such as Terracotta, Sandstone, Slate, and more. 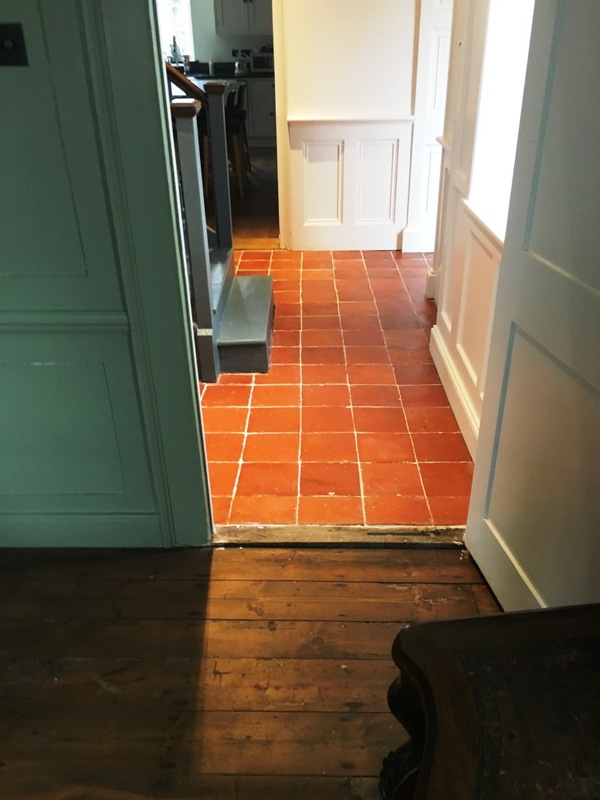 This Pamment tiled hall was in a Grade II listed former Manor House in the village of Creeting St Peter, there were three areas of floor requiring attention two having being recently laid and the other the original floor. 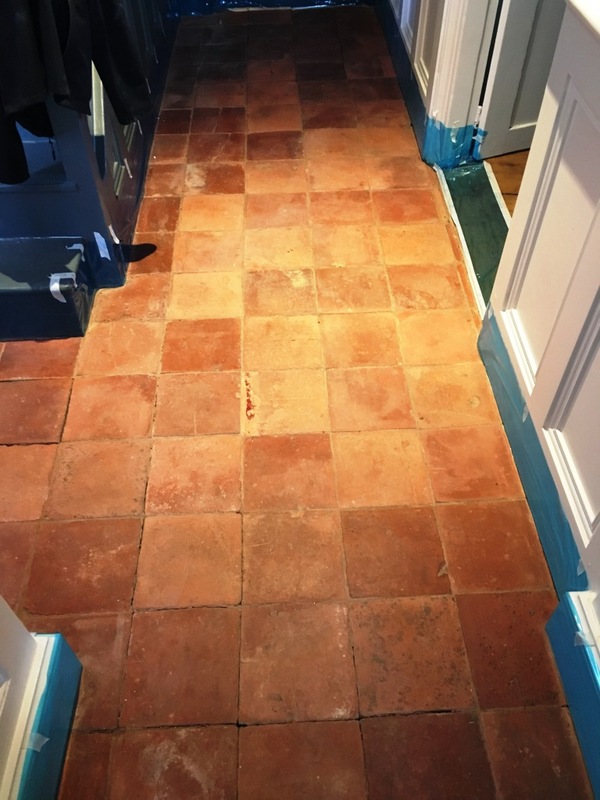 Similar to Terracotta, Pamment tiles are made from Clay and have been traditionally used throughout Norfork and Suffollk. 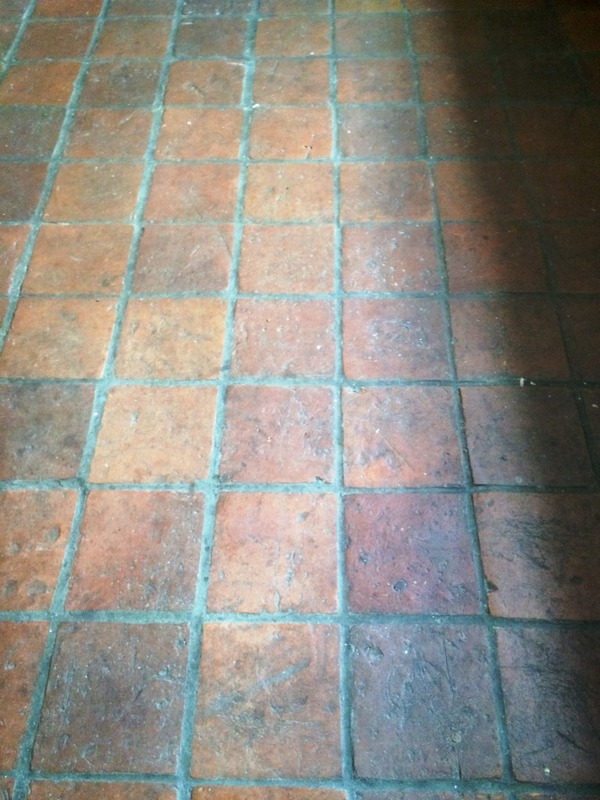 I started the job using a solution of Tile Doctor Pro-Clean, which is a heavy duty cleaner ideal for stone, tile and grout. The cleaner was diluted with water and left to soak into the Pamment tile and grout for about 10 minutes before being scrubbed in with a black pad fitted to a rotary machine. 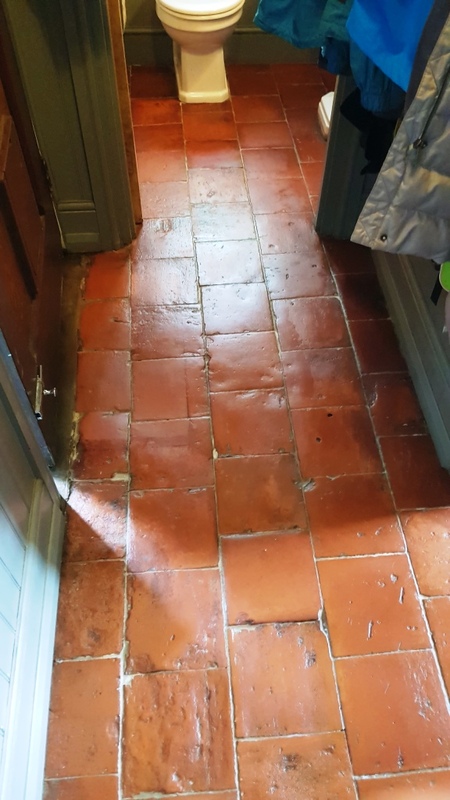 The soiled solution was then removed with a wet vacuum and washed down with clean water to neutralise the floor of any chemical; we repeated this process a couple of times and we also used a stiff hand brushes to clean up the grout lines. Once happy the floor was given a final rinse and left to dry overnight, A dehumidifier was left running to ensure that the floor would be dry enough to seal the next day. The next day came back to do the sealing and after checking the floor had dried sufficiently proceeded to seal it . 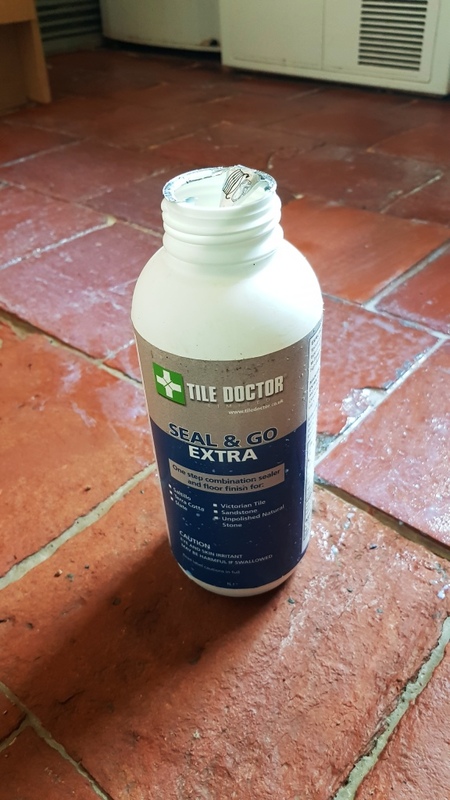 Tile Doctor Seal and Go was used to seal the floor, it’s a water based sealer so it doesn’t give off an odour when it’s drying and also offers durable stain protection together with a low sheen finish which enhances the look of the tile. 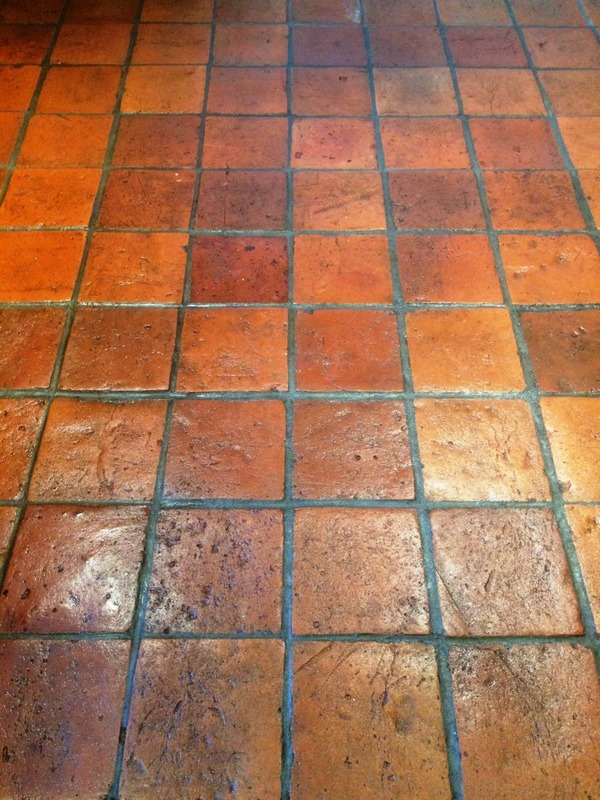 Like Terracotta Pamment tiles are very porous and took seven coats of sealer r before it was fully sealed. The work took two days in all and now the floor is much easier to maintain.